Have you read one of Ayn Rand’s thought-provoking novels? Now’s the time! Enter an Ayn Rand Institute essay contest 2017 for your chance to win thousands of dollars in cash prizes. 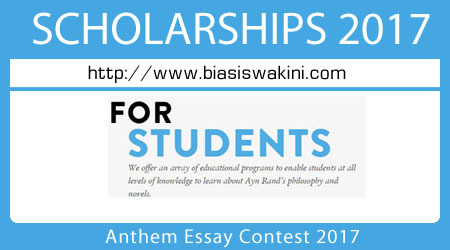 ARI has held worldwide essay contests for students on Ayn Rand’s fiction for thirty years. This year we will award over 500 prizes totaling more than $90,000. 0 Komentar untuk "Anthem Essay Contests 2017"